Being somewhat of a beer snob, I usually try to seek out the mainstay and new microbrews of a country. Vietnam’s Pasteur Street Brewing Co. is a diamond in the rough – especially after you have far too many 333 or Tiger on the Vietnam Backpacker’s Castaway Tour. If you’re ever in Saigon, hopefully, this Pasteur Street Brewing Co. Review will entice you to swing by & enjoy a pint of their craft beer. Usually, before I go on a trip, I like to google to see what the craft beer scene is. In Tokyo, it was this small bar with an amazing selection (they even had Stone); in Ireland, I just grabbed bottles from the market; in Kenya, well… that was a tough one. 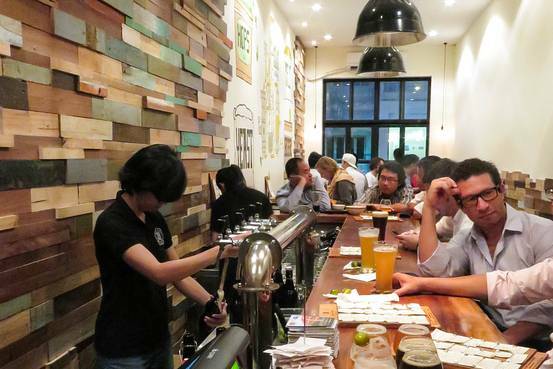 Surprisingly, Vietnam’s craft beer scene appears to be booming. RateBeer.com usually has a running list of all the breweries in a certain city. I was pleasantly surprised to see the Saigon has a couple breweries & brewpubs. I first stumbled upon Têtê Beer – which was started by a couple of ex-pats and seemed to be the most popular. Their website is also beautiful (as is Pasteur Street’s) and shows you all the places around the city of Saigon where you can purchase their beer at a bar. It was during this search that I would first stumble upon Pasteur Street Brewing Co.
My main priority for this trip was to get a custom tailored suit jacket. But, coming in at a close second was trying a craft beer from Vietnam. During the last full-day that Zach and I had in Vietnam, we went on the free Trails & Tales walking tour around Saigon for a few hours. Usually, after taking one of these tours, I like to treat the guide to lunch and chat about the city, their background, and their favorite spots in the city. During this lunch, Adam has mentioned Pasteur Street brewing Co, their one porter, and how they have a pretty cool taproom and beer selection that we should check out. Having his recommendation for that sealed the deal. We were now on a mission to make it to Pasteur Street and then make our 8am flight the next day. We wound up deciding to check out the taproom around 9pm on a Saturday night. The location is 144 Pasteur Street – go down the alleyway, go up a flight of steps, and boom you’re in their taproom. The taproom is probably 20 feet wide by 150 feet long – enough to accommodate ~50-ish people. Let me tell you, there were definitely 50+ people in there on a Saturday – mainly comprised of what I would assume are Ex-Pats, foreigners on trips, and then locals (being the smallest group). Being on the 2nd floor of a building was pretty cool. The front of the taproom has large glass windows that overlooked Pasteur Street. So, you could watch motorbikes whiz by while enjoying your beer. Service from the waitresses was OK. We found ourselves to be waiting ~10-15 minutes after we ordered our flights to actually receive them. It’s no big deal – I’m just glad that we weren’t in a hurry. They had 12 beers on tap on their menu – ranging from $4-10 per pint. Which is ludicrously expensive compared to 333 or Tiger (which could be had for less than 50 cents usually). Zach and I decided to get two flights of beer – 6 beers per flight. I took the first page & he took the 2nd page. The one stout for some reason couldn’t be included in a flight for some reason, so I ordered that after we imbibed in our flights. Now, I’m not sure if it’s the variation in the water quality, the use of local ingredients, or something else – but a good number of the beers seemed to be watered down. Their IPA didn’t punch like IPAs I’m used to in the USA. Their Double IPA tasted more like an IPA – even tho the ABV was >8%. The fruit that they utilized in their beers was definitely fresher than I was accustomed to. You could just taste the difference as compared to a beer brewed with fruit in the US that probably uses a concentrate of that flavor. The beer that we had to order separately since it wasn’t included in the flights was the Cyclo Imperial Chocolate Stout – clocking in at a boozy 13%. From quickly Googling this brewery, I was delighted to find that other people enjoyed their beer as much as we did. At the Asian Beer Festival, Pasteur Street Brewing Co took home 3 Gold and 1 Silver medal – more than any other brewery in attendance. They even won First Place in the Chocolate Category in the World Beer Cup! If these awards don’t make your head turn with curiosity for this small brewery, I’m not sure what will. My favorite beer of the evening was definitely PSBC Double IPA. This is the beer that I thought tasted more like an IPA (not a double). If you’re looking to see what beers they have on tap, their Untappd Activity is pretty solid. We also ordered the Nashville Hot Chicken as a late night snack, which came recommended to us by our waitress. The kitchen is open fairly late – 10pm if I recall correctly. The chicken was excellent to snack on with our beers. All-in-all, I think that the craft beer scene is definitely booming in Vietnam. Pasteur Street Brewing Co is a testament to this.